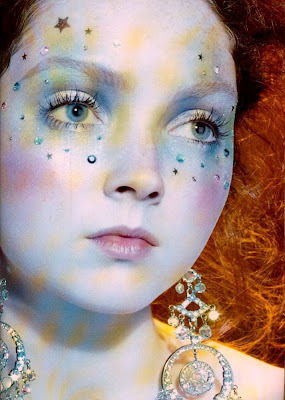 Lily Cole has the look and spirit of a boho girl; her porcelain doll features and beautiful curly hair have been an inspiration for many photographers and fashion designers. She was born in Torbay, England in 1988 and was discovered at the age of 14 while she was walking on the streets of Soho. Her big break came in 2003, when she caught the eye of photographer Steven Meisel, who was captivated by her porcelain skin, and fiery red hair. Lily has appeared in several advertising campaigns (Chanel, Christian Lacroix, Hermes, Top shop, Anna Sui cosmetics, etc.) and fashion editorials. She is also well known in catwalks of the international runway circuit and has walked many top shows ( DKNY, Jean Paul Gaultier, Versace, Alexander Mc Queen, John Galliano, to name a few). Lily is also a passionate environmentalist. She wrote the foreword for Tamsin Blanchard’s latest book, Green Is the New Black, and is actively involved with WaterAid, the Environmental Justice Foundation, and the Western Shoshone. At the age of 17, Lily turned her back on an expensive contract with De Beers, the diamond-mining firm, over human-rights issues. She has been seen wearing the eco-friendly Anya Hindmarch handbag with the slogan "I'm Not A Plastic Bag"
Isn't she an inspiration? Lily has a great spirit because she stands ups for what she believes. Her boho style is undeniable; she is definitely a fashion icon. Ps: You can enlarge pics 1,2,3, just click on the picture. Photography: Vogue Italia May 05, Vogue Italia-March 07, Vogue Italia & Vogue Germany August 06. Great to read about someone standing up for what she believes - good for her! Loved the post. Inspiring! This is a beautiful post. Beautiful girl standing for beautiful causes. she's beautiful! she looks like a little doll :) great pics! Lily is an amazing model. She has a look all her own. Gorgeous! Lily Cole has such a unique face! Love the pics! Lily takes the most divine photos. I love her alternative look and ability to tell a story. gracias por pasarte por el mio too. love that girl... es una modelo tan distinta.